Not everyone is lucky enough to live in a spacious house. And if you are a city dweller where everything is so pressed for space you might even have to settle for a small apartment. But human psychology works in a way that we always want to have more. Therefore, people tend to alter their small dwellings attempting to add more space. To somehow expand the miniature rooms, they start demolishing walls or removing partitions. However, there are a lot of simpler ways to maximize your living space. With our tips, you will learn to create optical illusions that make even the smallest rooms look bigger. The easiest way to visually extend the space in your rooms is to add more light. If your ceilings are not high enough, wall lamps directing the light up will help draw out the walls. To enhance this effect you can paint the ceilings in light colors. Bear in mind that dark tones can reduce the room’s illumination by 20-40%. If you want to visually increase the space in the bathroom there is never a real problem – bathrooms traditionally have many reflective surfaces. When catching the light, they create an effect of blurring boundaries. Designers advice using halogen light bulbs placed behind the cornice. Such wall-washing illumination helps optically raise the ceiling and add more space to the room. Living rooms and bedrooms, as a rule, don’t have many reflective surfaces. However, there are some hacks to visually expand their space. When you choose a lamp for a room with low ceiling, avoid massive chandeliers. The larger the lamp and the lower it hangs down the less the ceiling height appears. For small rooms, it is sometimes better to completely abandon the general illumination. You can disperse light with the help of sconces, floor and table lamps. A good idea is to use high standard lamps. Vertical objects visually draw the room up, and due to well-lit corners, the apparent volume of space will increase. What you shouldn’t do when choosing paints and wallpapers is to pick dark tones. To expand the space in a small room, you should opt for cold and light colors: pale green, gray-blue, pearl colors. If you want to add more volume to bigger rooms, take warmer shades on board: peach, lemon and, pale pink will work just fine. When designing with bamboo flooring, your best option is to choose a slightly more contrast color. It is even better if you treat the floors with varnish. A subtle reflection will help to visually extend the room. The same effect will bring out wallpapers with large patterns. However, you need to be aware of the following nuances. 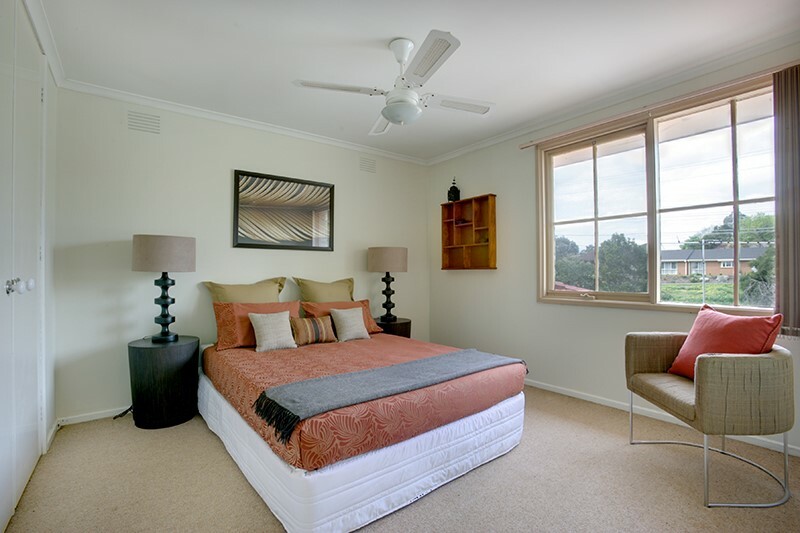 If you choose cold shades for your room, you will undoubtedly make it visually larger and more spacious. However, such a color scheme will make you feel less cozy. Therefore, you might want to choose cold tones for a living room and study, while for the bedroom it is more suitable to use warm colors. 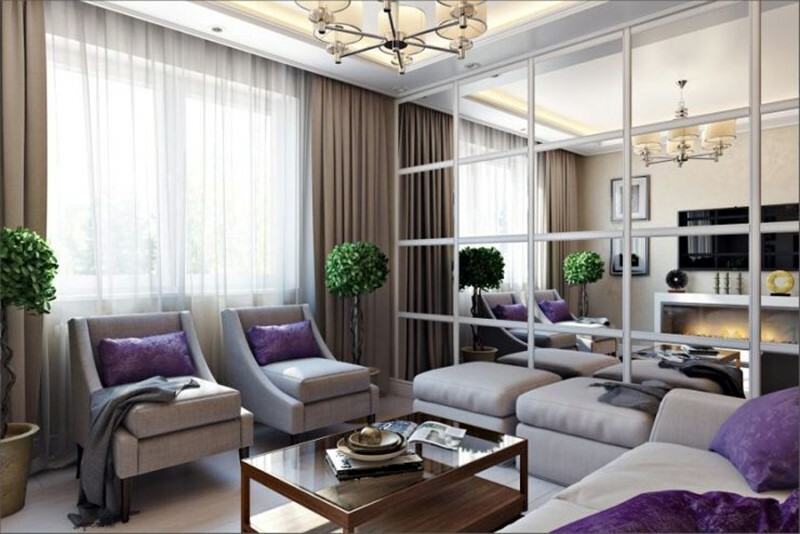 If your house has low ceilings, you can visually increase their height by placing a tall mirror on the wall. You will immediately see how the space perception changes. If there is a dark wall in the room, it may optically shrink the space and give you a feeling of coldness. Hang a mirror on such a wall. It will reflect the light and bring in some bright colors. A mirror will work best if you hang it in front of a window or another mirror – light will fill the room, making it bigger visually. In addition to mirrors, you can try and experiment with furniture that has reflective surfaces. Thanks to the reflection of light, such furnishing never looks too big or bulky regardless of its size. At the same time, the space in the room will expand almost unlimitedly. The concept of “texture” combines a multitude of elements: furniture, wallpapers, the floor, and what it is made of … Let’s start with the floor. If your house or apartment has miniature rooms small rugs are never a good idea. Instead, let the floor made of natural materials dominate in a tight space. The textures of such floorings are easy on the eye and devoid of large patterns. You can make your room look more spacious if you lay out floor elements diagonally. Bamboo flooring manufacturers always offer an abundant selection of styles, colors, and patterns to choose from. But don’t get carried away with the superfluity of options. Unfading classic is always your best friend – the floor in a lighter color with a pattern not overloaded with details. 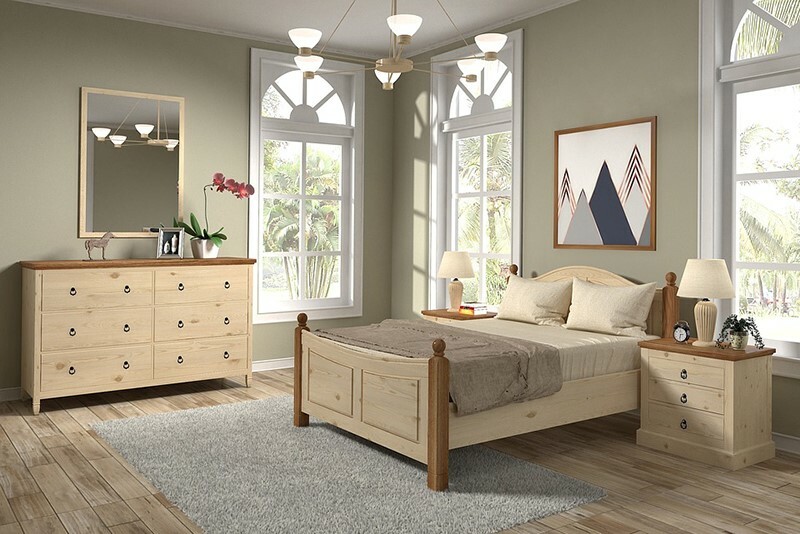 As for the furniture, it is better to get rid of everything that is too big and bulky. In this situation less is more. 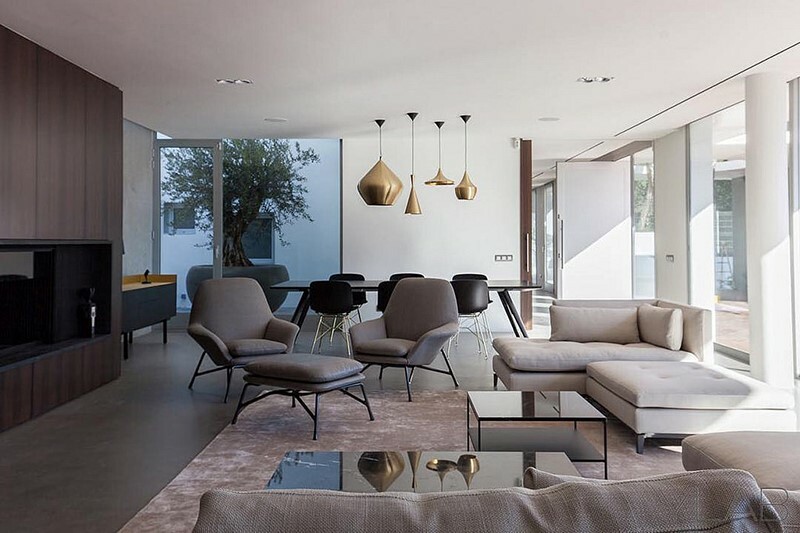 Today’s interior design is affected by minimalism trend. For small spaces, it is more beneficial to use furniture with strict geometric forms. Curved lines and decorative lining will have to be left behind. Furniture should be simple and functional. Give up a few stand-alone cabinets and chests of drawers in favor of a single large closet. Also, avoid partitioning a small room with a sofa, table or closet. It is best to place furniture along the walls. When choosing the color of furniture, you can rely on the color of your walls. The same color scheme with elements of different tones will work the best. Don’t be afraid that your interior will look boring – you can always enhance it with eye-catching detail (paintings on the walls, flower pots, decorative cushions, etc.). Horizontal stripes on the wallpapers or tiles visually “stretch” the room but reduce its height. Vertical stripes work in the opposite way – they make the walls appear taller but the room may seem tighter. This is also true for ornaments. Small details will increase the space while large ones will do the opposite. Remember this rule when you decorate your room with paintings. Tall paintings and lamps add more height to the walls. As you can see, to expand the boundaries of a small room you do not need to make any radical changes. Simple knowledge of optical transformation of space and a little bit of creativity will help make your house more spacious even without significant investment.